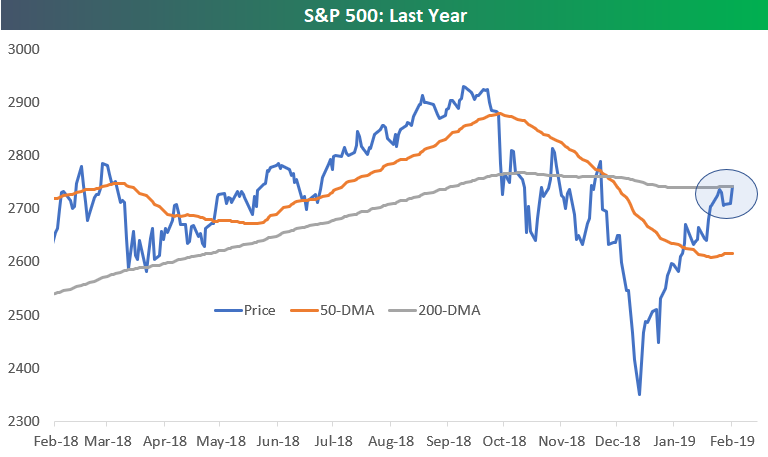 The S&P 500 is up 1.2% today, and the gains have the index once again testing resistance at the 200-day moving average. Last Tuesday we failed the first test, and now we’re seeing another test today. With the S&P’s price right at 2,742 as we type, the index needs to rally just over a point up to 2,743.36 to get to the 200-day. A close above the 200-day would be viewed as a win by market technicians, and the index can then set its sights on the next level of resistance right around 2,800. Let’s see how the day finishes. If the recent pattern of late-day buying that we’ve been seeing continues today, it will make the snowy trek home from Wall Street a bit more bearable!